We do not know how life began upon the earth. Biologists, that is to say, students of life, have made guesses about these beginnings, but we will not discuss them here. Let us only note that they all agree that life began where the tides of those swift days spread and receded over the steaming beaches of mud and sand. The atmosphere was much denser then, usually great cloud masses obscured the sun, frequent storms darkened the heavens. The land of those days, upheaved by violent volcanic forces, was a barren land, without vegetation, without soil. The almost incessant rain-storms swept down upon it, and rivers and torrents carried great loads of sediment out to sea, to become muds that hardened later into slates and shales, and sands that became sandstones. The geologists have studied the whole accumulation of these sediments as it remains today, from those of the earliest ages to the most recent. Of course the oldest deposits are the most distorted and changed and worn, and in them there is now no certain trace to be found of life at all. Probably the earliest forms of life were small and soft, leaving no evidence of their existence behind them. It was only when some of these, living things developed skeletons and shells of lime and such-like hard material that they left fossil vestiges after they died, and so put themselves on record for examination. The literature of geology is very largely an account of the fossils that are found in the rocks, and of the order in which layers after layers of rocks lie one on another. The very oldest rocks must have been formed before there was any sea at all, when the earth was too, hot for a sea, to exist, and when the water that is now sea was an atmosphere of steam mixed with the air. Its higher levels were dense with clouds, from which a hot rain fell towards the rocks below, to be converted again into steam long before it reached their incandescence. Below this steam atmosphere the molten world-stuff solidified as the first rocks. These first rocks must have solidified as a cake over glowing liquid material beneath, much as cooling lava does. They must have appeared first as crusts and clinkers. They must have been constantly remelted and recrystallized before any thickness of them became permanently solid. The name of Fundamental Gneiss is given to a great underlying system of crystalline rocks which probably formed age by age as this hot youth of the world drew to its close. The scenery of the world in the days when the Fundamental Gneiss was formed must have been more like the interior of a furnace than anything else to be found upon earth at the present time. After long ages the steam in the atmosphere began also to condense and. fall right down to earth, pouring at last over these warm primordial rocks in rivulets of hot water and gathering in depressions as pools and lakes and the first seas. Into those seas the streams that poured over the rocks brought with them dust and particles to form a sediment, and this sediment accumulated in layers, or as geologists call them, strata, and formed the first Sedimentary Rocks. Those earliest sedimentary rocks sank into depressions and were covered by others; they were bent, tilted up, and torn by great volcanic disturbances and by tidal strains that swept through the rocky crust of the earth. We find these first sedimentary rocks still coming to the surface of the land here and there, either not covered by later strata or exposed after vast ages of concealment by the wearing off of the rock that covered them later–there are great surfaces of them in Canada especially; they are cleft and bent, partially remelted, recrystallized, hardened and compressed, but recognizable for what-they are. And they contain no single certain trace of life at all. They are frequently called Azoic (lifeless) Rocks. But since in some of these earliest sedimentary rocks a substance called graphite (black lead) occurs, and also red and black oxide of iron, and since it is asserted that these substances need the activity of living things for their production, which may or may not be the case, some geologists prefer to call these earliest sedimentary rocks Archaeozoic (primordial life). They suppose that the first life was soft living matter that had no shells or skeletons or any such structure that could remain as a recognizable fossil after its death, and that its chemical influence caused the deposition of graphite and iron oxide. This is pure guessing, of course, and there is at least an equal probability that in the time of formation of the Azoic Rocks, life had not yet begun. Overlying or overlapping these Azoic or Archaeozoic rocks come others, manifestly also very ancient and worn, which do contain traces of life. These first remains are of the simplest description; they are the vestiges of simple plants called algae or marks like the tracks made by worms in the sea mud. There are also the skeletons of the microscopic creatures called Radiolaria. This second, series of rocks is called the Proterozoic (beginning of life) series, and marks a long age in the world’s history. Lying over and above the Proterozoic rocks is a third series, which is found to contain a considerable number and variety of traces of living things. First comes the evidence of a diversity of shellfish, crabs, and such-like crawling things, worms, seaweeds, and the like; then of a multitude of fishes and, of the beginnings of land plants and land creatures. These rocks are called the Palaeozoic (ancient life) rocks. They mark a vast era, during which life was slowly spreading, increasing, and developing in the seas of our world. Through long ages, through the earliest Palaeozoic time, it was no more than a proliferation of such swimming and creeping things in the water. There were creatures called trilobites; they were crawling things like big sea woodlice that were probably related to the American king-crab of today. There were also sea scorpions, the prefects of that early world. The individuals of certain species of these were nine feet long. These were the very highest sorts of life. There were abundant different sorts of an order of shellfish called brachiopods. There were plant animals, rooted and joined together like plants, and loose weeds that waved in the waters. It was not a display of life to excite our imaginations. There was nothing that ran or flew or even swam swiftly or skillfully. Except for the size of some of the creatures, it was not very different from, and rather less various than, the kind of life a student would gather from any summer-time ditch nowadays for microscopic examination. 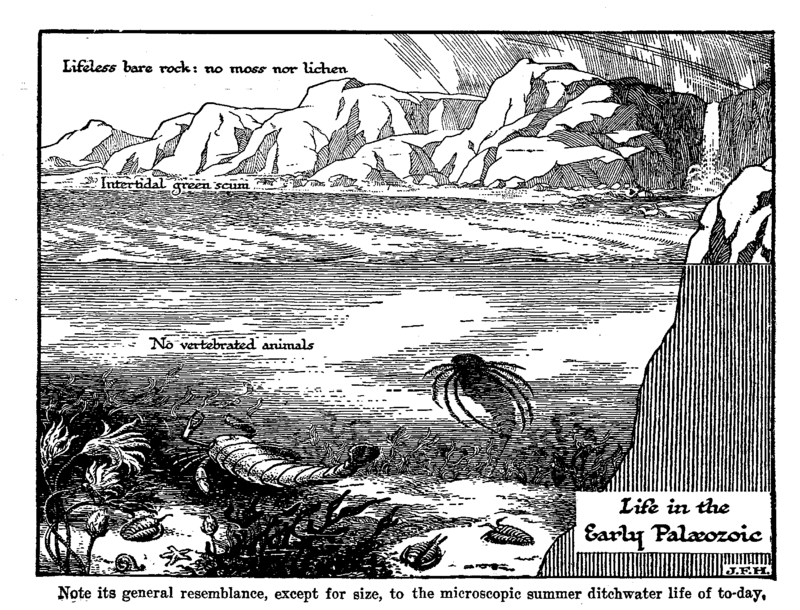 Such was the life of the shallow seas through a hundred million years or more in the early Palaeozoic period. The land during that time was apparently absolutely barren. We find no trace nor hint of land life. Everything that lived in those days lived under water for most or all of its life. Between the formation of these Lower Palaeozoic rocks in which the sea scorpion and trilobite ruled, and our own time, there have intervened almost immeasurable ages, represented by layers and masses of sedimentary rocks. There are first the Upper Palaeozoic rocks, and above these the geologists, distinguish two great divisions. Next above the Palaeozoic come the Mesozoic (middle life) rocks, a second vast system of fossil bearing rocks, representing perhaps a hundred millions of swift years, and containing a wonderful array of fossil remains, bones of giant reptiles and the like, which we will presently describe; and above these again are the Cainozoic (recent life) rocks, a third great volume in the history of life, an unfinished volume of which the sand and mud that was carried out to sea yesterday by the rivers of the world, to bury the bones and scales and bodies and tracks that will become at last fossils of the things of to-day, constitute the last written leaf. These markings and fossils in the rocks and the rooks themselves are our first historical documents. The history of life that men have puzzled out and are still puzzling out from them is called the Record of the Rocks. By studying this record men are slowly piecing together a story of life’s beginnings, and of the beginnings of our kind, of which our ancestors a century or so ago had no suspicion. But when we call these rocks and the fossils a record and a history, it must not be supposed that there is any sign of an orderly keeping of a record. It is merely that whatever happens leaves some trace, if only we are intelligent enough to detect the meaning of that trace. Nor are the rocks of the world in orderly layers one above the other, convenient for men to read. They are not like the books and pages of a library. They are torn, disrupted, interrupted, flung about, defaced, like a carelessly arranged office after it has experienced in succession a bombardment, a hostile military occupation, looting, an earthquake, riots, and a fire. And so it is that for countless generations this Record of the Rocks lay unsuspected beneath the feet of men. Fossils were known to the Ionian Greeks in the sixth century B.C., they were discussed at Alexandria by Eratosthenes and others in the third century B.C., a discussion which is summarised in Strabo’s Geography (?20-10 B.C.). They were known to the Latin poet Ovid, but he did not understand their nature. He thought they were the first rude efforts of creative power. They were noted by Arabic writers in the tenth century. Leonardo da Vinci, who lived so recently as the opening of the sixteenth century (1452-1519), was one of the first Europeans to grasp the real significance of fossils, and it has been only within the last century and a half that man has begun the serious and sustained deciphering of these long-neglected early pages of his world’s history. Here in this history of life we are doing our best to give only known and established facts in the broadest way, and to reduce to a minimum the speculative element that must necessarily enter into our account. The reader who is curious upon this question of life’s beginning will find a very good summary of current suggestions done by Professor L. L. Woodruff in President Lull’s excellent compilation The Evolution of the Earth (Yale University Press). Professor H. F. Osborn’s Origin and Evolution of Life is also a very vigorous and suggestive book upon this subject, but it demands a fair knowledge of physics and chemistry. Two very stimulating essays for the student are A. H. Church’s Botanical Memoirs No. 183, Ox. Univ. Press. There is a discussion of fossils in the Holkham Hall Leonardo MS.
2.2 How Old is the World?